This park preserves 40 miles of the middle Delaware River and almost 70,000 acres of land along the river's New Jersey and Pennsylvania shores. At the south end of the park, the river cuts eastward through the Appalachian Mountains at the scenic Delaware Water Gap. A one-day auto tour of the park can include waterfalls, rural scenery, and historic Millbrook Village. Visitors can also canoe, hike, camp, swim, picnic, bicycle, crosscountry ski, and horseback ride. See a complete list of activities below. Accessible parking, buildings, and restrooms at visitor centers and at Headquarters. Accessible picnic sites at Kittatinny, Depew, and Watergate in New Jersey, and at Milford Beach, Childs Park, Toms Creek, and Smithfield Beach in Pennsylvania. Brochure on accessibility in the park is available at visitor centers and at Headquarters. 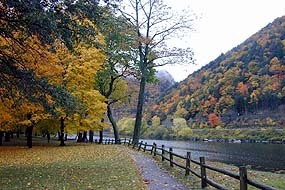 The Delaware Water Gap National Recreation Area is located in both Pennsylvania and New Jersey along approximately 40 miles of the Delaware River. This area falls within five counties, three in Pennsylvania (Northampton, Monroe, and Pike) and two in New Jersey (Warren and Sussex). Since the area is so large we would recommend that you start your visit at one of our visitors centers. No public transportation is available within the recreation area. Location - In the former St. John's Church, on the east side of Route 209 just south of the blinking light at Bushkill Falls Road in Bushkill PA. Follow signs on Route 209. Signal your turn. Turn with caution. Closures - CLOSED EARLY FALL THROUGH LATE SPRING. For park information, call Headquarters (570) 588-2451. Special Programs - Ranger programs are given at the visitor center and at Dingmans Falls and other Pennsylvania locations in summer. Children's materials (Junior Ranger, Junior Naturalist, and Junior Time Traveler booklets) available. Groups interested in scheduling a program in the park should call the visitor center year-round at 570-588-7044. Lecture Series: monthly program spring to summer. Exhibits - Changing temporary displays. Available Facilities - Ranger-staffed park visitor center for the Pennsylvania side of the recreation area: information desk, displays, bookstore, restrooms. Post office and food store within 1/4 mile. The door to the visitor center is located on the south side of the building. The visitor center is fully accessible. The parking lot is gravel. Closures - Dingmans Falls Area is closed for reconstruction all summer. This includes the boardwalk to Silverthread and Dingmans Falls, the visitor center, and the parking area. Location - Headquarters is located on River Road, one mile east of the traffic light on Route 209 at Fernwood resort in Bushkill PA. Signal your turn. Turn with caution. Available Facilities - Park Headquarters and Administrative Building. Also provides visitor information, parking, and restrooms. Headquarters is fully accessible. Location - Located in New Jersey on the south service road to Interstate 80 at the Delaware Water Gap. Westbound on Interstate 80, take NJ Exit 1 and bear left off the ramp 300 yards to the visitor center. Eastbound on Interstate 80, take the first exit ramp in New Jersey after the toll plaza at the Delaware River, and continue straight off the ramp 200 yards to the visitor center. Closures - CLOSED WEEKDAYS EARLY FALL THROUGH LATE SPRING. For information on weekdays call Headquarters at (570) 588-2451; on weekends call the visitor center at (908) 496-4498. Special Programs - Ranger programs take place at the visitor center in summer. Hike and bike tours start at the visitor center in summer. Children's materials (Junior Ranger, Junior Naturalist, and Junior Time Traveler booklets) are available. Groups interested in scheduled programs should contact the visitor center 908-496-4458 year round. Exhibits - Two permanent exhibits and a variety of temporary displays. Available Facilities - Ranger-staffed park visitor center for the New Jersey side of the recreation area: information desk, restrooms, bookstore, boat & canoe launches, picnic area, views of the Gap, trailheads to Mt. Tammany and Appalachian Trails. The parking area and the visitor center are fully accessible. The picnic area has accesible parking and accessible picnic tables. Location - At the junction of Old Mine Road and Route 602 in New Jersey, 12 miles north of Interstate 80. Closures - BUILDINGS CLOSED TUESDAY SEPTEMBER 2, 2003 THROUGH LATE SPRING 2004 EXCEPT FOR SPECIAL EVENTS (See park events calendar.) Grounds remain open dawn to dusk year round. Special Programs - Craft demonstrations and house tours on weekends in summer. See park events calendar for details of the following events: Historic Activities Day: a weekday in May Millbrook Days (first full weekend in October): activites, demonstrations, costumed villagers. Octivites, a children's craft program, in late October. "Victorian Christmas" weekend in early December. Exhibits - Spangenburg Cabin, near the parking lot, contains exhibits and information. Available Facilities - Grounds are open dawn to dusk year round. Restrooms, water, phone, parking. Hiking trails nearby. The historic buildings at Millbrook Village are not accessible due to steps and narrow doorways. The restroom building and phone are accessible. The path through Millbrook Village is not paved but is flat and wide. Reaching the picnic area just off the road would require assistance. Make your reservations for lodging near Delaware Water Gap National Recreation Area!